Father David was born in Kentucky, the fourth- generation son of Methodist ministers and missionaries. He attended Asbury College in Kentucky earning a BA in Christian Education and Missions. During a summer spent doing missionary work in Colombia, SA, he met Rozanne, the daughter of missionaries to Brazil. They were married and entered into career missionary service with a Protestant organization which specialized in planting churches and seminaries around the world. Their thirteen years of Protestant missionary service would take them to Japan and China. During that time Fr. David also completed his Master of Divinity degree at Asbury Theological Seminary. They returned to Kentucky from China in 1993 for Fr. David’s doctoral studies in Missiology while Rozanne completed a master’s degree in Marriage and Family Therapy at the University of Kentucky. They were Chrismated in the Evangelical Orthodox Church in 1995 and planted a mission parish in Nicholasville, KY, which was received into the Orthodox Church in America in February 2002. Fr. David was ordained to the Priesthood that year. The Ruckers continued serving the parish they founded until December 2006, when Fr. David was asked to be the Associate Director of the Orthodox Christian Mission Center in St. Augustine, FL. 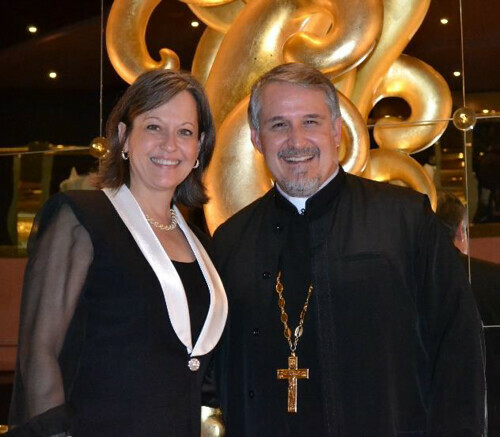 In 2013 the Ruckers became Mission Specialists, participating in the training of clergy for 40,000 new Orthodox Christians in 100 churches in Guatemala and Mexico, while Fr. David did doctoral work at St. Vladimir’s Seminary. In 2015 they joined the faculty of St. Herman Theological Seminary in Kodiak, Alaska, where Fr. David now serves as Administrative Dean. When not in Alaska or Florida they teach and speak in parishes and conferences across the USA, for the edification of the local parish. Rozanne is a licensed Marriage and Family Therapist (LMFT) and certified teacher. She is a national clinical supervisor for Parenting with Love & Limits (PLL). They have three children on earth, one in heaven, and three grandsons. Hobbies include water sports and long walks together on trails and beaches.